I like the last set of pics. As to Grand Duchess Maria Therese... She looks lovely, don't get me wrong, but if she looked in the mirror and took something off, what was it? Why would you have a 10.74 karat ring! With the right color and clarity, I'd make that sacrifice. Oh yeah. mousiethe diamond it 10 point 74 carat not 1074 carat, five carat weights about one gram, so the stone weights a little over two grams that's not to heavy if you ask me! let's go to the land of the rising sun! This crown was used by Reza Shah, the founder of the Pahlavi dynasty, in his coronation on 25 April 1926. His son, Mohammad Reza Shah Pahlavi, the last Shah of Iran, also used the crown in his coronation on 26 Oct. 1967. The crown was designed and built by a group of Iranian jewellers, under the supervision of Haj Serajeddin, the famous jeweller who had been in the employ of the Amir of Bokhara and had later emigrated from the Soviet Union to Iran. The stones were selected from loose stones in the treasury. The crown made of red velvet, gold, and silver. The design of the crown incorporates a motif of the Sassanid dynasty, which ruled over the Persian Empire from the 3rd through the 7th centuries AD. The Kiani Crown was used during the Qajar dynasty. Reza Shah, the founder of the Pahlavi dynasty, had his own crown designed but the Kiani crown was present during his coronation. The crown itself is made of red velvet which has thousands of gems set onto it. Fathali Shah is often shown in paintings wearing a similar crown - it is not known whether there were a number of crowns in use at the time which looked similar, or whether the artists simply portrayed the same crown in different ways. The Kiani crown has about 1800 pearls sown onto it. There are approximately 300 emeralds set on the crown. There are also about 1800 rubies and spinels on the crown. The largest diamond is 23 cts. Also known as the Shahi Sword, it was a present to Nasseridin Shah from Amin-o'Sultan, his prime minister. Before his assassination, Amin-o'Sultan served in the court of a number of Kings in that capacity. However, he wasn't as well appreciated by the common folk. Through his various posts, which included the Minister of the Interior and the Minister of the Treasury and Customs, he managed to accumulate sufficient wealth to afford such presents. Though the picture is only of the sword''s handle and hilt, the scabbard is entirely encrusted with approximately 3000 jewels of similar quality. According to an inscription which appears on the sword, it was made in 1306 (lunar calendar) by Mirza Ali Nagi. However, the sword was not presented to the King until six years later, around 1894 or 1895 AD. This sword was worn by Mohammad Reza Shah during his coronation in 1967.
different countries and different times i guess. This belt is woven of gold and can be seen in photographs of Nasseridin Shah Qajar from the second half of the 19th century. The belt band is 119 cm. and was therefore probably made for Nasseridin Shah, or his father, Mohammad Shah. It could not have been built for Fathali Shah, who was known to have a narrow waist. The oval-shaped emerald on the beltbuckle is surrounded by diamonds. The Sea of Light Diamond "Darya-e Noor"
One of the largest diamonds in the world, this pink diamond and the Koh-e Noor (Mountain of Light) diamond were both brought back from India by Nader Shah in 1739. After the death of Nader Shah, Ahmad Shah Durrani took the Koh-e Noor to Afghanistan, where it passed onto Shah Shuja. He, in turn, was defeated by Ranjit Singh, the Lion of the Punjab. Eventually, it fell into the hands of the East India Company, which presented it to Queen Victoria. The Koh-e Noor is now incorporated in the Queen Mother''s crown. The Koh-e Noor is said to bear a curse since all the male owners of the Kohi Noor suffered terrible fates. This Darya-e Noor (Sea of Light) diamond, however, has a different story. After Nader Shah''s death, the Darya-e Noor was inherited by Shahrokh Mirza, his grandson. It then came into the possession of Alam Khan Khozeimeh, and later, Lotfoli Khan Zand, a member of Iran''s Zand Dynasty. Agha Mohammad Khan, cruel founder of Qajar dynasty, defeated the Zands, and so it came into the possession of the Qajars. Fathali Shah Qajar had his name inscribed on one facet. Later, Nasseridin Shah Qajar believed that that this diamond was one of the gems decorating the crown of Cyrus the Great, so he often wore it on an armband. When armbands fell from royal fashion, he wore it as brooch. On occasion, the gem would be left in the care of high personages of the land, as a sign of honor, though it was eventually kept hidden in the Golestan Palace treasury museum until Mozzafaridin Shah''s time, when he wore it as a hat decoration while visiting Europe in 1902. Reza Shah, the founder of the Pahlavi dynasty, wore it as a decoration on his military hat during his coronation in 1926, and it was used in Mohammad Reza Shah Pahlavi''s coronation ceremony in 1967. There is no doubt that the diamond was taken from the Golkandeh mines of southern India. In 1965, a Canadian team which was conducting research on the Imperial jewels concluded that this Darya-e Noor may have been part of a large pink diamond which was incorporated in the throne of the Moghul emporor Shah Jehan and described in the journal of the French jeweller Tavernier in 1642, who called it the "Diamanta Grande Table" in his journal. This diamond may have been cut into two pieces; the larger part is the Sea of Light, and the smaller part of is believed to be the Noor-ol Ein diamond which is presently incorporated in a tiara in Iranian imperial jewel collection. Once Muhammad Reza Shah placed the Pahlavi crown on his own head during his coronation ceremony in 1967, he placed this crown on the head of his wife, the Empress Farah. Until that date, the wives of Persian monarchs were not crowned, and so it became necessary to design a new crown for the occasion. That honor was bestowed on the French jewellers, Van Cleef & Arpel. In accordance with tradition, the gems used in this crown were selected from loose gems in the treasury. The crown is made of green velvet, and white gold. It has more than 38 emeralds, 105 pearls, 34 rubies, 2 spinels, and 1,469 diamonds. The centerpiece of this tiara is the Noor-ol-Ain diamond, which is one of the largest pink diamonds in the world. The diamond may have been brought from India, along with the Sea of Light diamond. The diamond is set in platinum, and is surrounded by pink, clear and yellow diamonds. The Noor-ol-Ain is a brilliant cut, almost tear shaped diamond of approximately 60 cts. 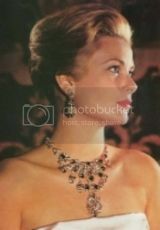 ; the other diamonds range from 14 to 19 cts. each. The tiara was designed by Harry Winston for the occasion of the Empress Farah''s wedding to the the last Shah of Iran, Mohammad Reza Shah Pahlavi, in 1958. In 1719, Emperor Peter I "the Great" (reigned 1682-1725), founded the earliest version of what we now know as the State Diamond Fund of the Russian Federation. Peter I had visited other European nations, and introduced many innovations to Russia, one of which was the creation of a permanent fund to house a collection of jewels which belonged not to the Romanov family, but to the Russian State. Peter declared that the state holdings were inviolate, and could not be altered, sold, or given away - and he also decreed that each subsequent Emperor or Empress should leave a certain number of pieces acquired during their reign to the State, for the permanent glory of the Russian Empire. Peter left all of the pieces used in the coronation ceremony to the Diamond Fund, as well as many important pieces of 15th, 16th and 17th century jewellery. The pieces were housed in a special secure room in the Winter Palace in St. Petersburg, first called the Renteria, and subsequently called the Diamond Chamber. The Great Imperial Crown made in 1762 for the coronation of Catherine the Great by the court jeweller J.Pauzie represents the height of creative imagination, lavish beauty and skilled workmanship. It is adorned with five thousand diamonds arranged in a splendid pattern of laurel wreaths and oak branches. The glitter of the diamonds is enhanced by two rows of gleaming pearls and the crown is topped by a huge red spinel, the second largest in the world, which weighs almost 400 carats. The Sceptre has the world''s famous "Orlov Diamond", the largest faceted diamond weighing 189 carats. Peter''s daughter Elizabeth I (reigned 1741-1761) had a voracious taste for jewellery, and a number of the most beautiful pieces of the Rococo period date from her reign, such as the remarkable Earrings in the form of garlands of flowers with bees. The remaining pieces, which are the historically and artistically most important from the collections include the coronation regalia, and a spectacular collection of eighteenth and nineteenth century jewellery. The pieces went on display for the first time in 1967 as a commemoration of the 50th Anniversary of the revolution, when they were displayed in a special vault beneath the Kremlin to high-ranking officials and foreign dignitaries. The treasures of the Diamond Fund are part of the national state heritage. Since the fall of communism, the pieces are on display to the public, who can buy tickets to visit the diamond fund when they go to the Kremlin Armory Museum in Moscow. The history of Russian jewellery goes back over one thousand years. Many of the earliest pieces of Russian jewellery are very similar in style to pieces which were worn at the court of the Byzantine Empire. As ancient Rus and Kiev grew into what we now know as Russia, the style changed very little. It was not until Emperor Peter I "the Great" that real innovations and exchanges with the west changed Russian jewelry style for ever.The steady influence of foreign jewellers, combined with the Russian jewellers own creativity ended up establishing a Russian jewellery industry of great size and importance. Snuffbox, Gold, cut diamonds, diamond roses, glass and silver, 1775 .During the second half of the 18th century the Russian imperial collection of items of jewellery was being continually added to. Such pieces included snuffboxes, which might also be used as awards or diplomatic gifts. Catherine II herself was a passionate collector of snuffboxes made of rare stones and was generous in her presentation of such objects to those around her. The 19th century brought changes in the organization of jewelry making. Many famous jewellers worked in Russia, and some, such as Fabergé have become household names. Peter Carl Fabergé, the son of French-German ancestors, ruled the world of jewels in the four decades prior to the outbreak of the World War I. The House of Fabergé became world-famous. It produced interalia, figurines made of semi-precious stones, snuffboxes, powder-boxes and items of jewellery. The jewels were forgotten for a time, and it was not until 1926 that they were found in the Kremlin, and the pieces opened, catalogued, and photographed in their entirety. An enormous selection of the pieces were sold to an American consortium, and the pieces, which comprised close to 70% of the original collections, were sold at Christie''s Auction house in London in 1927. The pieces which were sold were dispersed all over the globe, and many of their locations are now unknown. Only six of the Imperial Easter eggs contained mechanism. The Coronation Egg is enamelled a deep gold hue over guilloche sunburst patterns and blanketed by a gold trellis marked by diamond-set Imperial eagles at the intersections.